Many of my best records were bought in a records shop that Leo Schelvis owned, called Forever changes . A few years ago Leo sold the shop; he had already switched most of his attention to e-Bay and earned more money there than in real life. I never buy at e-Bay; not only because I have no credit card, but also because it is not my thing. 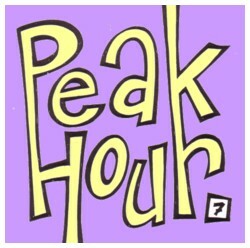 Anyway, for about a year Leo did a weekly radio show for alocal radio station, called Peak Hour. He played mainly instrumental music, from hard to get records from his massive collection. At that time (this must be eight years ago or something like that) Leo was deep into soundtrack LP’s, but he also played obscure stuff from whatever he could lay his hands on. I was not home every time the show was aired, but I tired to miss as little as possible. And I recorded the show on my minidisk recorder. The box with all the Peak Hour minidisks is one of the many projects that I would like to finish before I leave this planet, but so far I have only digitalised about ten hours of songs. And there are at least thirty hours more to go. And believe me, this isall the kind of stuff you would love to hear! Well, I would love to hear it myself, on CD in stead. Leo is a nice guy and he has very interesting things to say about the records and artists he played in Peak Hour, but of course I edit all his talking out when I make CD’s of the minidiscs. But, of course, if you want to hear Leo, I can make you a CD with only him talking. I met him last weekend on a flea market, and he was doing well. Still trading records on e-Bay. Here is a song from Peak Hour, from a Bollywood soundtrack LP by Anandji & Katyani, Fear of a brown planet , although I would not take word for what I wrote down phonetically eight years ago.